Fluoropolymers Additives Market size is set to surpass USD 1.9 billion by 2025; according to a new research report by Global Market Insights, Inc.
Increasing demand for light weight thermoplastics as substitutes for metals and increasing demand for innovative architectural coatings in infrastructure development should stimulate fluoropolymers additives market growth. These materials offer exceptional heat & chemical resistance, high tensile strength and low coefficient of friction which enhances the performance of end use applications such as coatings, insulation wires & coaxial cables. Rising investments in buildings & construction and growth in demand for lightweight plastics in automotive is further expected to fuel the market demand. Polytetrafluoroethylene is utilized in several end use industries such as automotive, consumer electronics and semiconductor industries pertaining to its superior thermal stability, low maintenance cost, corrosion and weather resistance nature. Rising demand for high performance polymers in industrial, transport and electronics industries are likely to boost the fluoropolymers additives market demand. Additionally, rapid expansion of automotive industry and increasing demand for lightweight automotive materials will further boost market growth. PTFE fluoropolymers additives market size for printing inks application may expect consumption at above 70 kilo tons by 2025. These fluoropolymers enhance the adhesion and rub performance when added to the ink. These products provide superior surface protection, wetting and high pigment stabilization properties. Increasing technological innovations and growing demand of printing inks in several industries will further stimulate the market. U.S. fluorinated ethylene propylene (FEP) fluoropolymers additives market demand should record gains of about 6.5% by 2025. These products find applications in industrial machines & equipment and automotive industries owing to their high electrical property, chemical inertness and reduction in carbon dioxide emission thereby contributing to environment protection. Rising demand for melt processable thermoplastics in several end use industries will boost the fluorinated ethylene propylene regional market growth. 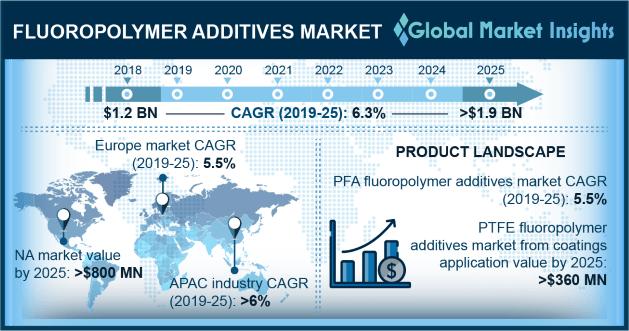 UK PTFE based fluoropolymers additives market from lubricant & grease applications was valued at over USD 2.5 million in 2018. These products provide improved performance of lubricants, maximized surface areas and low co-efficiency of friction of synthetic solids. Rising automotive production and rising manufacturers inclination towards setting up blending plants along with research & development centers across Eastern European countries may enhance lubricants demand further optimize the market growth. China PFA based fluoropolymers additives market from coatings application may expect gains at above 5.5% pertaining to its exceptional corrosion resistance and abrasion resistance. PFA coatings offer chemical resistance and effective non-stick properties. These products have high impact resistance at elevated temperatures thereby ensuring long durability of end products. Rising infrastructural investments and booming building & construction industry should accelerate the industry growth. Maflon SpA, Daikin Industries, Shamrock Technologies, Micro Powders, 3M, and Solvay are the key market players catering in the industry. Manufacturers are engaged in strategic mergers & acquisitions to improve their global presence and enhance product portfolio. Companies are engaged in escalating their collaboration network to develop innovative products which is likely to stimulate fluoropolymers additives market growth.